Purpose: Use this document as a reference for enrolling staff in a retirement plan in ctcLink. You must know the EMPLID or name of the employee you want to enroll in the benefit, enter their ID in the Empl ID field. - This is particularly important for DRS administered plans. While an Election Date can be earlier than a Deduction Begin Date, it must never be later on an Elect action or else there will be data issues. - Retirement is the only enrollment screen in which Election Date must be changed purposefully (Refer to Dates on Retirement Plan Pages QRG). For permanent queries in production, a query request must be sent to the service desk with as much detail included as can be provided by the requestor so that it can go through all needed query request protocols. 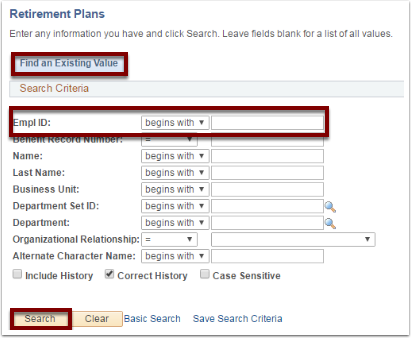 At that time the query request will be assigned to the query team and a team member will work directly with the requestor. For other information on retirement contributions, Payroll tables would need to be consulted, in which case the Payroll Administrator would need to be consulted.